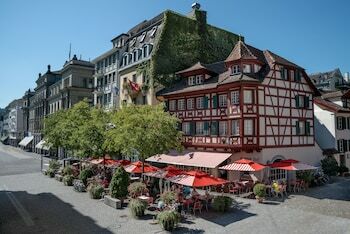 With a stay at Hotel Rebstock Luzern, you'll be centrally located in Lucerne, just a 5-minute walk from Loewenplatz and 10 minutes by foot from Lucerne Town Hall. Featured amenities include a business center, complimentary newspapers in the lobby, and dry cleaning/laundry services. Self parking (subject to charges) is available onsite. With a stay at Grand Hotel Des Bains in Lavey-Morcles, you'll be convenient to Chateau de Saint-Maurice and Saint-Maurice Abbey. A stay at Hôtel Central-Résidence places you in the heart of Leysin, steps from Swiss Alps and 5 minutes by foot from Leysin-Berneuse Gondola.